We love the fact that we are inundated with birds in Orange. We are spectaularly oblivious to the incredible variety, colour and song... until we go elsewhere in the world and see lots of grey. Australia has now been shown by genetic analysis to be the home of many of the worlds birds, especially the most colourful and musical birds - so called 'songbirds'. NSW alone has as many parrots as Africa and Asia combined. So it's easy to think we need to travel the world to see beautiful birds... in fact we have them right here at home. The whole subject of vocal learning in birds is another extraordinary story. It is a source of joy to wake and hear Magpies early dawn chorus, it takes me back to when I was just a toddler. Then the Cockatoos, Currawongs and Galahs, the Eastern and the Crimson Rozellas, the King Parrots and the Lorikeets; the Red Wattle Birds [voice like a chainsaw but very friendly], the Blackbirds, the Sparrows, Crows - even the Pigeons. They're all welcome and they create such a wonderful symphony of calls and screeches, chatting amongst themselves and warning of one another approaching. There's a very clear hierarchy, but they all get their chance. 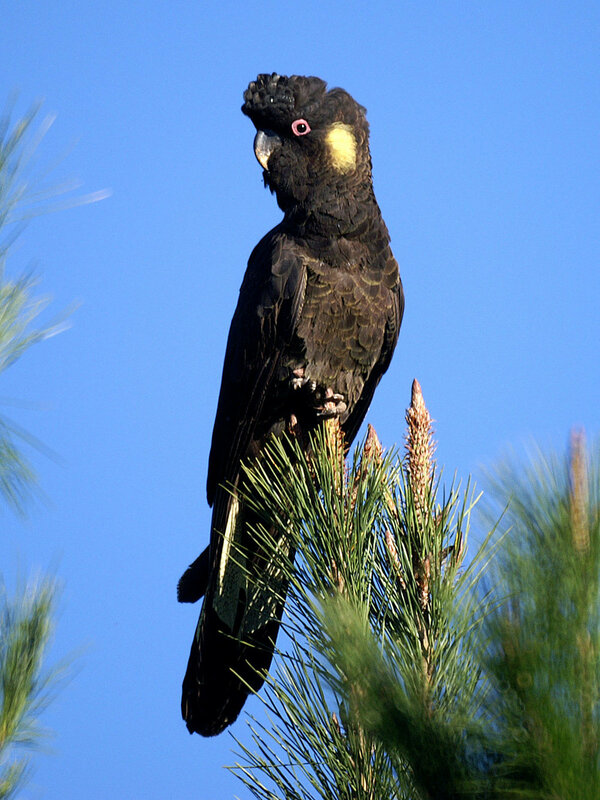 At this time of year we are pleasantly surprised by the Yellow Tailed Black Cockatoo. A magical bird to watch flying, more like soaring. Moving with such ease, seemingly effortless. And with a very distinct call. Sometimes called a wail, but there doesn't appear to be anything frightened, hurt or upset about it, that the word 'wail' might imply. On the contrary, it just seems to be their communication while flying. We see threes and fours, more to the point hear them from a long way off - look up and spot them high in the sky heading... somewhere. We've been fortunate to have the occasional visit in one of larger trees, but that's as close as they get. So if you're in and around Orange during winter, don't be surprised to hear an additional, very distinct bird call and see a flock of large black birds soaring overhead - it's just our Yellow Tailed Black Cockatoo friends paying us a visit - adding to the soundscape.